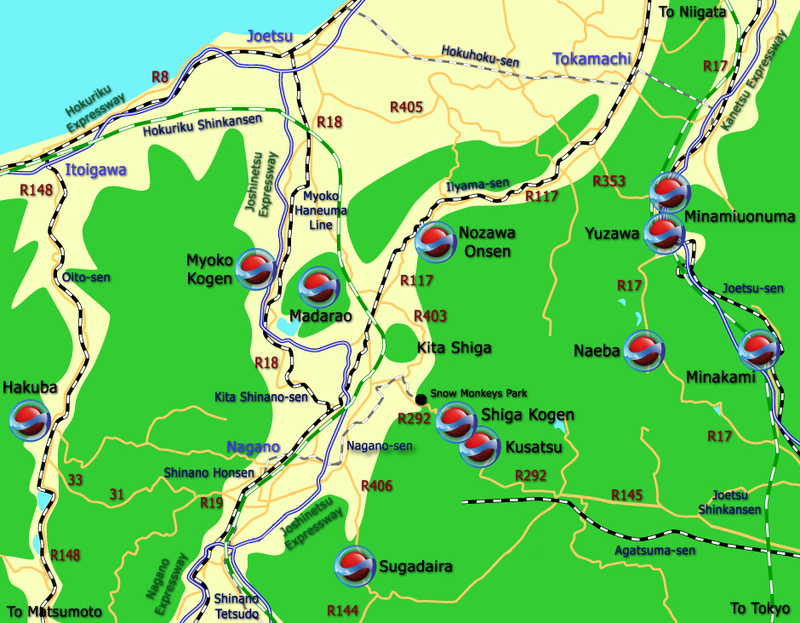 Sugadaira Kogen is a highland area in the northern region of Nagano Prefecture, to the south east of central Nagano City. Sugadaira is a popular destination throughout the year with many sports training grounds and open spaces for the summer seasons. 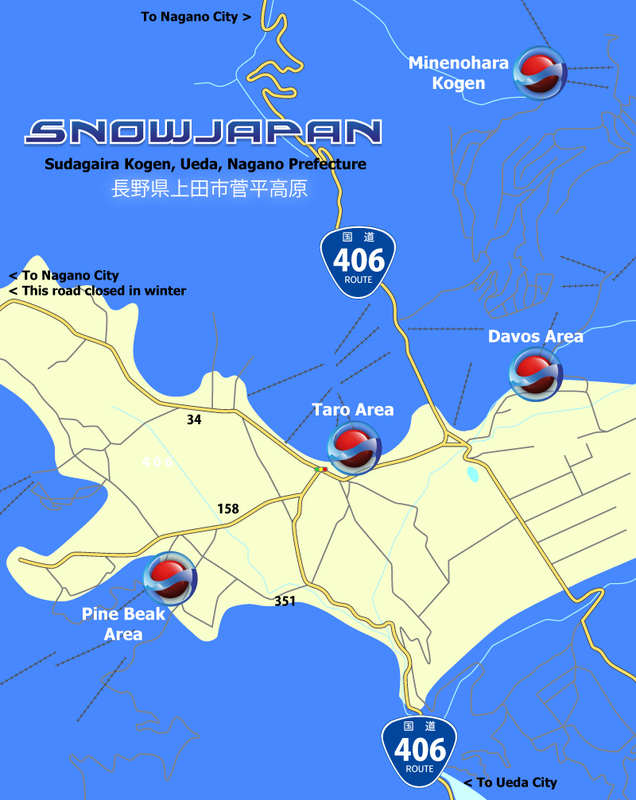 Sugadaira Kogen Snow Resort comprises of three main areas - Davos, Taro and Pine Beak - which share a lift ticket. While they are not all connected physically, a shared ticket is available as well as a shuttle bus running between them. Minenohara Kogen is a seperate resort closeby in the same highland region. Sugadaira is located to the north east of Ueda City and to the south east of Nagano City. The area is about 20km from the Ueda Sugadaira IC on the Joshinetsu Expressway coming from the south (using Route 144 and then Route 406), and about 20km from the Suzaka Nagano Higashi IC on the Joshinetsu Expressway coming from the north (using Route 406). From the northern Tokyo area, take the Kanetsu Expressway heading north west from Nerima IC to Fujioka Junction (about 80km). At Fujioka JCT turn onto the Joshinetsu Expressway heading west towards Nagano. Keep on the Joshinetsu Expressway for a further 98km, exiting at the Ueda Sugadaira IC. From the Ueda Sugadaira IC exit turn left onto Route 144 and follow the road for around 13km. Turn left onto Route 406 and follow the signposts to Sugadaira. The central Sugadaira highland area is about another 7km along Route 406. From central Nagano City head east on Route 18 or Route 403 towards Suzaka City and then take Route 406 through Suzaka and up towards Sugadaira. After a fun and very winding road journey on Route 406 the road eventually arrives in Sugadaira. The Suzaka Nagano Higashi IC on the Joshinetsu Expresway is the closest expressway exit to the north and is around 20km from central Sugadaira. From the IC exit, turn right onto Route 403 and after just under 1km turn right onto Prefecture Road 58. Sugadaira is mentioned on the main road signs from this point. Continue on this road for around 6km until you reach Route 406 where you should turn right and head up to Sugadaira. 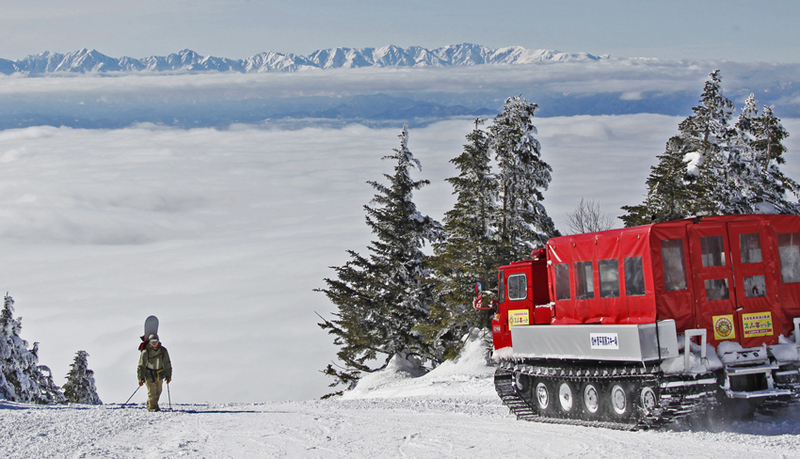 Note: Prefecture Road 34 connecting Nagano City with Sugadaira is closed during the winter season. From central Ueda City, head north east on Route 144 towards the Ueda Sugadaira IC of the Joshinetsu Expressway. Continue straight on past the IC exit and follow the road for a further 13km. Turn left onto Route 406 and follow the signposts up to Sugadaira. The central Sugadaira highland area is about another 7km along Route 406. From Karuizawa on local roads, head west on Route 18 towards Ueda City. From Ueda City follow the directions above. 菅平 パインビーク about 20km about 20km The Taro area of Sugadaira is located to the north of Route 406 going through the central Sugadaira area. 菅平 パインビーク about 20.5km about 23km The Pine Beak area of Sugadaira is located to the west of the main Route 406 going through Sugadaira. 菅平 ダボス about 21km about 20km The Davos area of Sugadaira is located to the east of the main Route 406 going through Sugadaira. 峰の原 about 24.5km about 21km Minenohara is a few km to the north of the Sugadaira areas. Arriving from the south go through Sugadaira and continue on Route 406 heading towards Nagano City. Minenohara is signposted (turn right) before the road starts to head back down to Nagano. Arriving from the north on Route 406, Minenohara is signposted (turn left) just before reaching the main Sugadaira area. From Sugadaira head north towards Nagano City and the Suzaka Nagano Higashi IC on the Joshinetsu Expressway using Route 406. Follow the signs to the Expressway by turning onto Prefecture Road 58 after about 13.5km. After about 6km, turn left onto Route 403 which heads towards the Suzaka Nagano Higashi IC. Continue on past the IC on Prefecture Road 58 to head into central Nagano. From Sugadaira head north towards Nagano City and the Suzaka Nagano Higashi IC on the Joshinetsu Expressway using Route 406. Follow the signs to the Expressway by turning onto Prefecture Road 58 at the traffic lights after about 13.5km. After about 6km, turn left onto Route 403 to the Suzaka Nagano Higashi IC in less than 1km. Take the expressway in a northerly direction for about 12km and exit at the Shinshu Nakano IC. From there either go straight ahead on the Shiga Nakano Toll Road (310 yen normal charge) or avoid the toll by turning right onto Prefecture Road 29 for about 3km and then turn left onto Route 403 until reaching Route 292 just over 1km later. Take Route 292 up to the Shiga Kogen area. (To avoid the expressway, head north on Route 403 from the Suzaka area). From Sugadaira head north towards Nagano City and the Suzaka Nagano Higashi IC on the Joshinetsu Expressway using Route 406. Follow the signs to the Expressway by turning onto Prefecture Road 58 at the traffic lights after about 13.5km. After about 6km, turn left onto Route 403 to the Suzaka Nagano Higashi IC in less than 1km. Take the expressway in a northerly direction for just about 38km and exit at the Myoko Kogen IC. From Sugadaira head north towards Nagano City and the Suzaka Nagano Higashi IC on the Joshinetsu Expressway using Route 406. Follow the signs to the Expressway by turning onto Prefecture Road 58 at the traffic lights after about 13.5km. After about 6km, turn left onto Route 403 to the Suzaka Nagano Higashi IC in less than 1km. Take the expressway in a northerly direction for about 20km and exit at the Toyota Iiyama IC. Turn right at the exit onto Route 117. Continue on Route 117 for about 20km until reaching a sign for Nozawa Onsen. Turn right here onto Prefecture Road 410. After 1km turn left onto Prefecture Road 38 which continues into Nozawa Onsen village. The resort car parks are clearly signposted on approaching the village. From Sugadaira head north towards Nagano City and the Suzaka Nagano Higashi IC on the Joshinetsu Expressway using Route 406. Follow the signs to the Expressway by turning onto Prefecture Road 58 at the traffic lights after about 13.5km. After about 6km, turn left onto Route 403 which takes you to the Suzaka Nagano Higashi IC in less than 1km. Take the expressway in a northerly direction for about 20km and exit at the Toyota Iiyama IC. At the exit traffic lights go straight ahead on Prefecture Road 96 for about 4km before turning right to head up to Madarao Kogen. From Sugadaira head north towards Nagano City and the Suzaka Nagano Higashi IC on the Joshinetsu Expressway using Route 406. Follow the signs to the Expressway by turning onto Prefecture Road 58 at the traffic lights after about 13.5km. After about 6km, turn left onto Route 403 to the Suzaka Nagano Higashi IC in less than 1km. Take the expressway in a westerly direction for about 10km and exit at the Nagano IC. At the Nagano IC exit, turn right onto Prefecture Road 35 for just under 3.5km heading towards central Nagano City. At the Route 19 (Nagano Minami Bypass) junction, turn left - Hakuba is signposted. After about 13.5km on Route 19 turn right onto the Hakuba Nagano Toll Road (210 yen) and from there Prefecture Roads 31 and 33 continue straight into Hakuba. From Sugadaira head north towards Nagano City and the Suzaka Nagano Higashi IC on the Joshinetsu Expressway using Route 406. Follow the signs to the Expressway by turning onto Prefecture Road 58 at the traffic lights after about 13.5km. After about 6km, turn left onto Route 403 to the Suzaka Nagano Higashi IC in less than 1km. Take the expressway in a northerly direction for about 20km and exit at the Toyota Iiyama IC. Turn right at the exit onto Route 117 and continue heading towards Tokamachi - through Iiyama, past Nozawa Onsen and through Tsunan town - for about 50km until reaching the Route 353 turn off. Turn right onto Route 353 which is signposted as Shiozawa and Route 17. Continue on Route 353 for about 18km until reaching Route 17. From this junction turn right to head into Yuzawa town. (Turn left for some resorts in Minamiuonuma). For detailed information on how to get to Sugadaira by train and public transport, please go to this section.